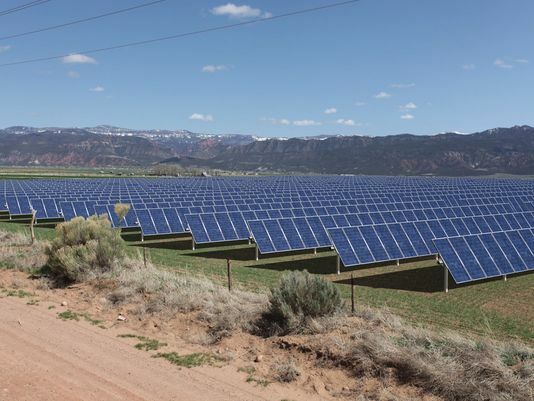 Scatec Solar North America, Inc., a division of Oslo Norway-based Scatec Solar is building a solar facility northwest of Parowan, UT in Iron County. Scatec, signed a contract with Rocky Mountain Power to supply power to Utah residents via solar. The power plant will be wholly owned by a partnership jointly owned by Google and Scatec Solar, which structured and executed the financing for the project. Scatec Solar will manage and operate the plant when it goes into operation. Size • Planned for 625 acres of private land next to a Rocky Mountain Power substation. Construction on the first of two phases is planned for later this year. Capacity • Plans call for eventual generation of 100 megawatts, enough to power 80,000 homes. Local benefits • The project will employ 120 to 200 construction workers for each phase of the project. Scatec hopes to eventually partner with Southern Utah University and Southwest Applied Technology Center for a permanent work force of about a dozen. Solar power in Utah has the capacity to provide almost a third of all electricity used in the United States. Utah is one of the seven US states with the best potential for solar power, along with California, Nevada, Arizona, New Mexico, Colorado, and Texas.